This post complements an article that was written in 2014, and can be found here. Since then, there have been some interesting developments in the area of Triassic pterosaurs that are worth mentioning, the most important being the recent description by Britt et al. (2018)  of a Triassic pterosaur from the Nugget Sandstone of Utah. This species, dubbed Caelestiventus hanseni, is very similar to the Jurassic genus Dimorphodon (Fig. 1), making it the first definitive Triassic member of the family Dimorphodontidae (Peteinosaurus may or may not be a dimorphodontid). Despite the similarities to Dimorphodon, Caelestiventus is bizarre in its large, leaf-shaped, laterally-compressed teeth on the upper jaw. Laterally-compressed teeth are rare for pterosaurs, although they have been documented in other Jurassic and Cretaceous groups (McLain and Bakker, 2017) . Fig. 1: A cast of the skeleton of Dimorphodon, a Jurassic pterosaur in the same family as the newly discovered Triassic form Caelestiventus. Image from Wikipedia, courtesy of MCDinosaurhunter (CC BY-SA 3.0). The most remarkable thing about Caelestiventus is that it was found in a deposit that has been interpreted to have been an ancient desert. The large crossbeds within the Nugget Sandstone are assumed to have been laid down by wind-blown dunes. However, this assumption may be misplaced, as another famous “desert” sandstone – the Permian Coconino Sandstone – has been argued from multiple strong lines of evidence to have actually formed underwater (Whitmore and Garner, 2018) . Another relevant change in the taxonomy of Triassic pterosaurs is that “Eudimorphodon” cromptonellus has now been placed into its own genus: Arcticodactylus (Kellner 2015) . In the same paper, Kellner also named BSP 1994 I 51 as Austriadraco dallavecchiai and named a “Eudimorphodon” specimen (MPUM 6009) Bergamodactylus wildi. However, Dalla Vecchia (2018)  concluded that Bergamodactylus is actually just a skeletally immature Carniadactylus. Surprisingly, Kellner noted a very unique feature in Austriadraco, which is previously unknown in any other pterosaur: a hole in the lower jaw called an external mandibular fenestra. The published phylogenetic tree in Britt et al. (2018)  shows with even greater clarity the claims that were made in the 2014 blog post: Triassic pterosaurs show up in the fossil record already diverse, with at least four separate clades [Dimorphodontidae, Eudimorphodontidae, Austriadraconidae (unnamed in the paper), and Preondactylus + Austriadactylus] and Peteinosaurus represented. Rather than finding a trunk to the pterosaur evolutionary tree, fossil discoveries continue to show pterosaurs of the Triassic to be fully-formed and remarkably diverse. Britt, B.B., Dalla Vecchia, F.M., Chure, D.J., Engelmann, G.F., Whiting, M.F., and Scheetz, R.D. 2018. Caelestiventus hanseni gen. et sp. nov. extends the desert-dwelling pterosaur record back 65 million years. Nature Ecology & Evolution 2:1386-1392. McLain, M.A. and Bakker, R.T. 2017. Pterosaur material from the uppermost Jurassic of the uppermost Morrison Formation, Breakfast Bench Facies, Como Bluff, Wyoming including a pterosaur with pneumatized femora. 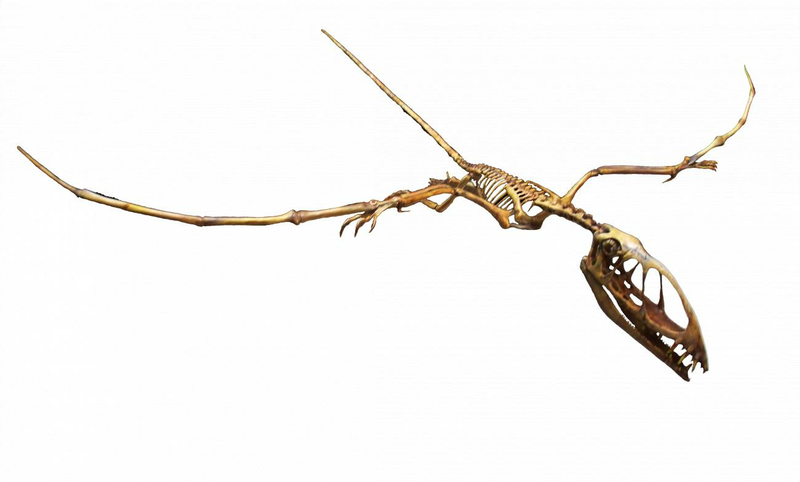 New Perspectives on Pterosaur Palaeobiology. Geological Society, London. Special Publications 455. Whitmore, J.H. and Garner, P.A. 2018. The Coconino Sandstone (Permian, Arizona, USA): Implications for the origin of ancient cross-bedded sandstones. In Proceedings of the Eighth International Conference on Creationism, ed. J.H. Whitmore, pp. 581-627. Pittsburgh, Pennsylvania: Creation Science Fellowship. Kellner, A.W.A. 2015. Comments on Triassic pterosaurs with discussion about ontogeny and description of new taxa. Anais da Academia Brasileira de Ciências 87(2):669-689. Dalla Vecchia, F.M. 2018. Comments on Triassic pterosaurs with a commentary on the “ontogenetic stages” of Kellner (2015) and the validity of Bergamodactylus wildi. Rivista Italiana di Paleontologia e Stratigrafia 124(2):317-341.